My name is Robin Wight and I would probably describe myself more of a designer rather than an artist. My career has always been in manufacturing, solving practical problems through design. My philosophy being, to get the design right and the aesthetic flows from the design (form follows function). 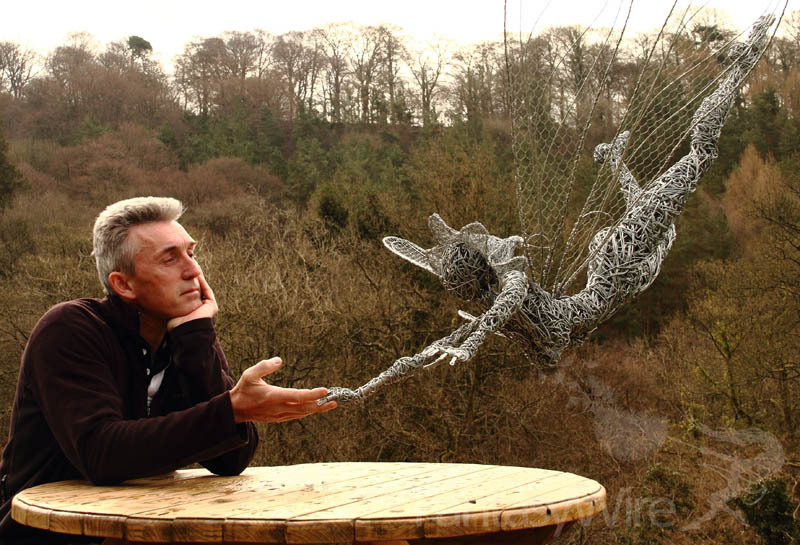 I’ve been an amateur artist all my life and making wire fairies is still (technically) only a hobby (I’m working on it!). In each fairy I try to apply design criteria, including a story, movement, some visual illusion, emotion and natural forces. As my new designs develop, I’d also like to create a fresh, contemporary view of fairies, avoiding the clichés and hopefully, as a result, deliver a balance of the traditional childlike whimsicality, with the aesthetic of a female form wrapped around an action type persona. It was while mending a fence that the idea of wire as a sculptural medium struck me. Wire is perfect for the amateur sculptor. Its cheap, its accessible to all, it doesn’t require any welding or special processes, and is virtually limitless in what you can produce. It’s like metal clay. All you need is a coil of wire, a pair of pliers and your imagination. If you would like to try it, a DIY kit will provide you with the basics. As It’s not how I earn my living, I don’t really have time to do commissions and prefer instead to keep designing and making new ones, but I do sell most of the ones I make. I’m totally amazed and delighted at the popularity of FantasyWire and it’s a testament to the benefits of social media that a complete amateur like me can get his work shared and seen by so many people. So thank YOU for turning my hobby into a fairytale / family business. The most common question I get asked is “How did you get started?” If you’d like to know the answer to this and how FantasyWire came about, download The Fairytale which will give you the whole story.